Frances has many years' experience writing travel articles and reviewing art galleries, museums, and the books they publish. This is one of El Greco's favourite subjects. He painted at least six versions of The Tears of Saint Peter/ Image by Frances Spiegel with permission from The Wallace Collection. In autumn 2017 the Wallace Collection presents El Greco to Goya - Spanish Masterpieces from The Bowes Museum. The exhibition explores three centuries of Spanish art through works by many of the great Spanish Masters including El Greco, Goya, Fray Juan Bautista Maino, Luis Tristan de Escamilla, Claudio Coello, Antonio de Pereda y Salgado and many others. The exhibition explores a period of rapid social change and religious and political upheaval in Spain. 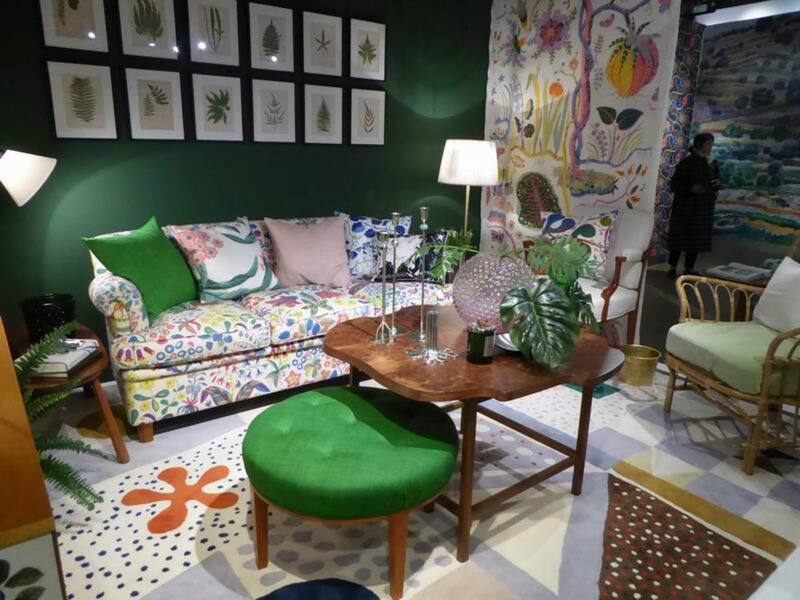 They provide a thought-provoking insight into the changes in style and subject matter during this critical period. The Wallace Collection thanks Sir Siegmund Warburg’s Voluntary Settlement, José Luis Colomer and the Centro de Estudios Europa Hispánica (CEEH), and Martin Randall Travel Ltd. for their generous support of this exhibition. Without the support of these organisations exhibitions like this would not be possible. The Bowes Museum and the Wallace Collection share many common factors. Both were established by individual families and both collections were bequeathed to the nation. John and Josephine Bowes were avid collectors of outstanding works of art and The Bowes Museum now has one of the world's finest collections of Spanish art. 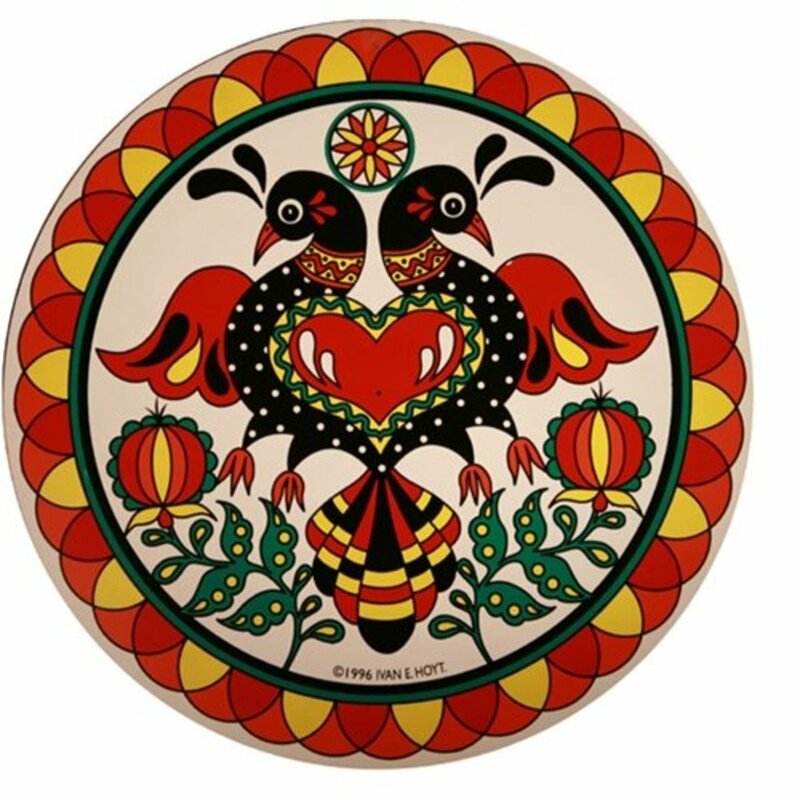 In this joint venture these works are now on display in London making them available to a wider audience in accordance with John and Josephine Bowes' wishes. Image by Frances Spiegel with permission from The Wallace Collection. 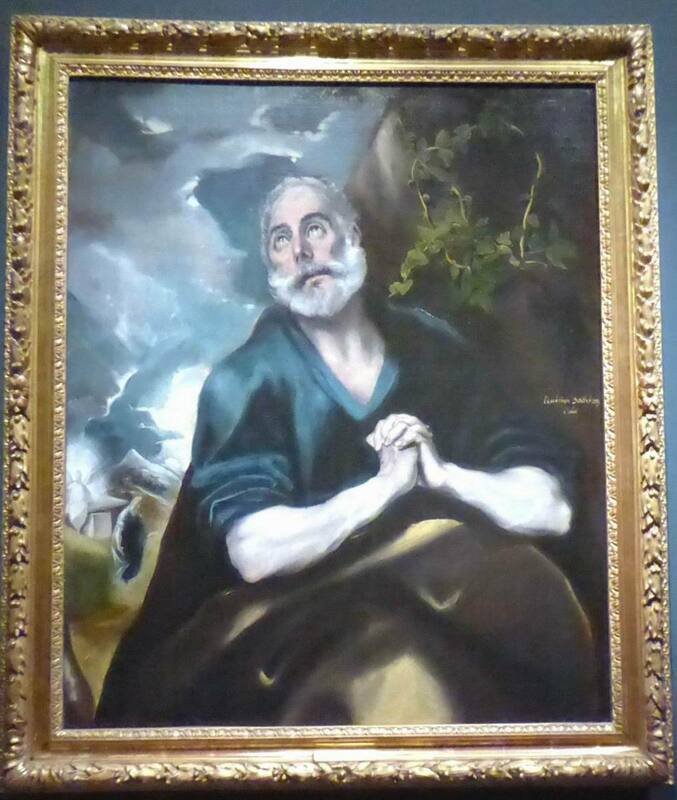 The Tears of Saint Peter, created and signed in about 1580 by El Greco (Domenikos Theotokopoulos 1541-1614) is thought to be the earliest of at least six depictions of this subject. The painting may have been inspired by Luigi Tansillo's Lagrime di San Pietro (Tears of Saint Peter). Saint Peter is shown hands clasped, repenting his betrayal of Christ after denying him three times. His upward, tearful gaze, stresses the Saint's spirituality. In the bottom left corner of the painting El Greco includes a second scene. He shows Mary Magdalene leaving Christ's open tomb after the Resurrection on Easter Sunday. An angel stands on guard at the entrance. In the far distance we see the city of Jerusalem. The artist's highly expressive style is apparent in the contrasting colours of the lighter clouds and darker sky, the same colour as St Peter's tunic. Goya shows us seven ghostly figures incarcerated in a dark, damp prison. Image by Frances Spiegel with permission from The Wallace Collection. 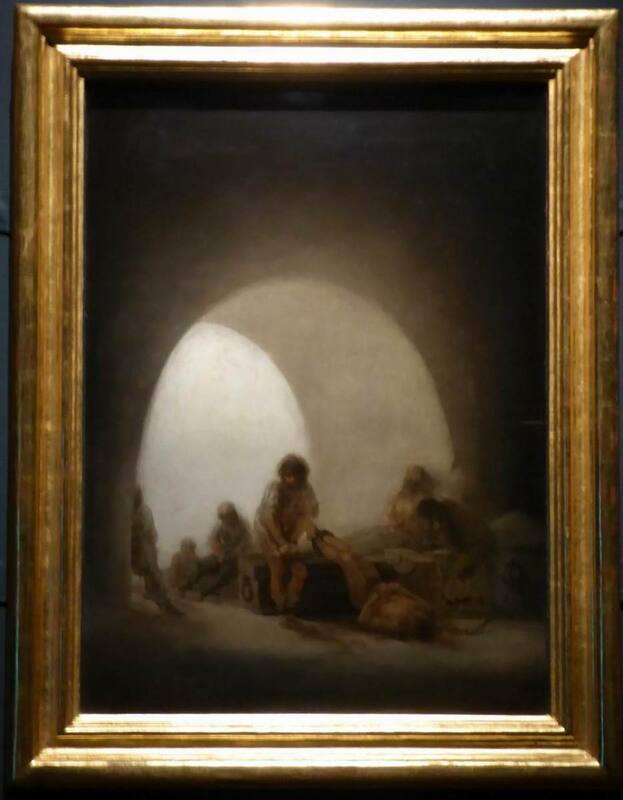 Also on display is Goya's Interior of a Prison (1793-94). Francisco Jose y Lucientes de Goya (1746-1828) makes reference to the events of the Peninsular War. The small size of this oil painting, 42.9 x 31.7 cm, emphasises the cramped conditions of the dark, dank prison. In this carefully lit, moody, melancholy scene we see seven figures bound by chains. Six are dressed in torn rags and one lies naked, chained round the neck. The bright light in the background serves to accentuate the despair of the prisoners' situation. Prisoners and prisons are common themes in Goya's works. 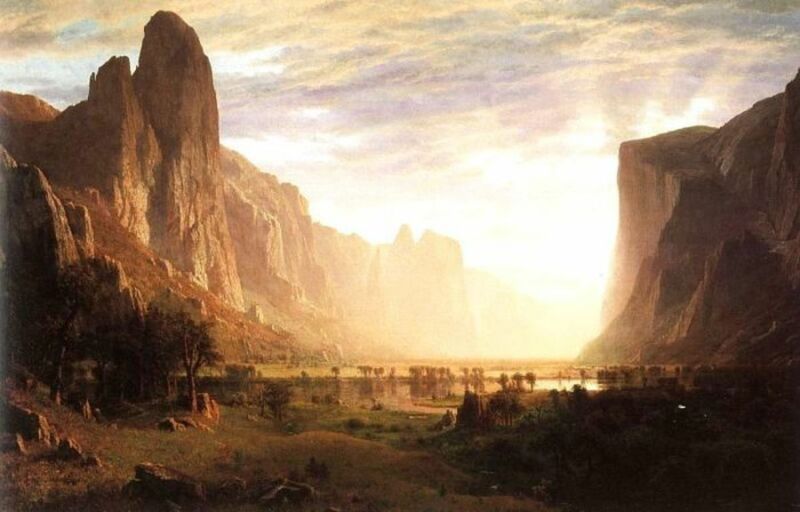 Painting tells the story of Tobias who restored his father's sight. Image by Frances Spiegel with permission from The Wallace Collection. 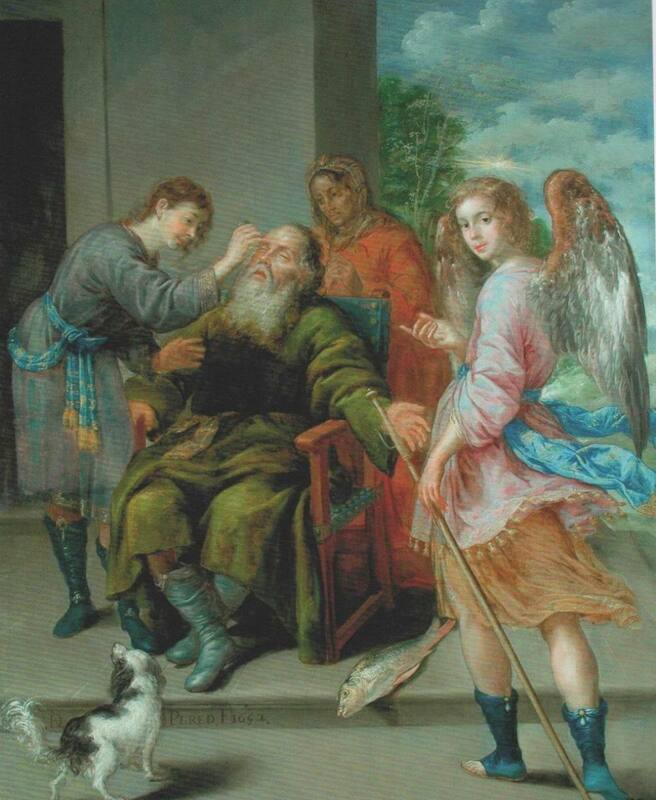 El Greco to Goya also features less well-known but equally important works such as Tobias Restoring his Father’s Sight by Antonio de Pereda y Salgado (1611-1678). Known as Pereda, the artist signed the work in 1652. He tells the story of Tobias (Book of Tobit). The pious Israelite Tobit was disgraced and went blind. He asked his son Tobias to travel to Media to collect a debt from a relative. Tobias set off on the journey accompanied by the Archangel Raphael disguised as a man. This man was sent by God to heal Tobit. Whilst crossing the river Tigris the party was attacked by a fish which Raphael told Tobias to capture. On returning home, Tobias restored Tobit's sight using the gall of the fish. In Pereda's painting we see Tobit seated slightly off centre. Tobias stands on his left pouring the gall into his father's eyes. Tobit's wife Anna stands behind the chair with Raphael on her right. He looks directly at the viewer as he points gracefully to the miraculous event. The exhibition is accompanied by a publication, El Greco to Goya: Spanish Masterpieces from The Bowes Museum, produced in collaboration with The Bowes Museum. Featuring excellent reproductions of all the works featured in the exhibition, this book is available from the Wallace Collection. El Greco to Goya is accompanied by a broad programme of educational events including lectures, seminars, art classes and a concert. The Wallace is particularly proud of their ‘Out of the Frame’ outreach programme. 'Out of the Frame' links residential care homes, day centres and supported housing units to local museums. Art is used as a stimulus for reminiscence and discussion. 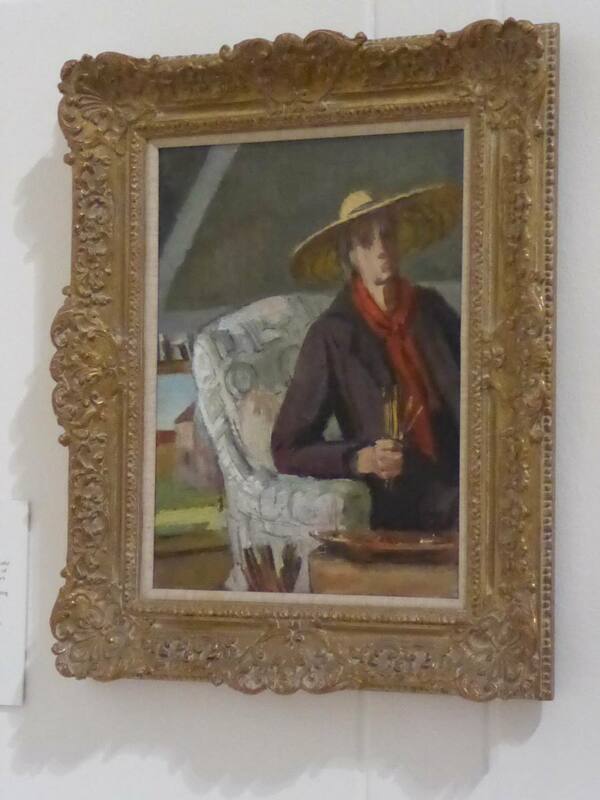 Through these sessions people who are unable to go to museums and galleries can enjoy art. Evidence shows that this close involvement with art helps combat isolation and loneliness and promotes health and well-being in the older population. Further details of this outstanding exhibition can be obtained from the Wallace Collection. 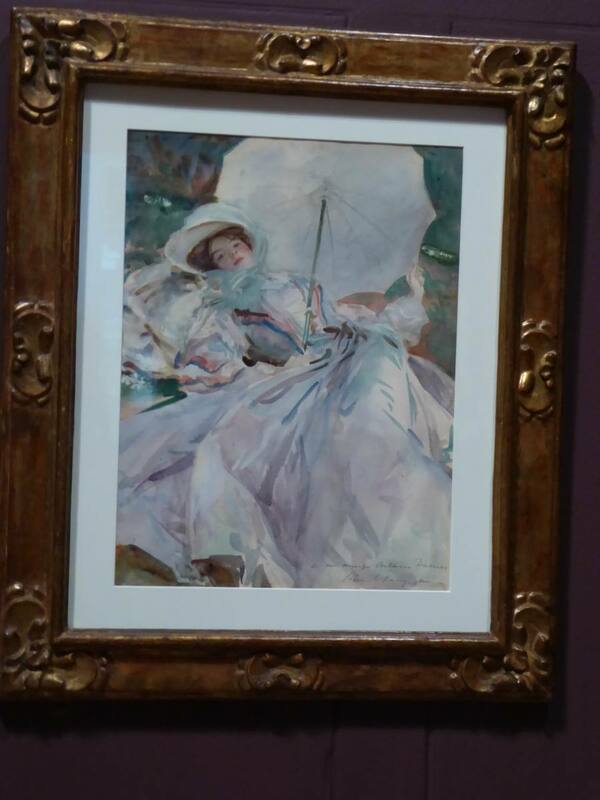 Why Were the Impressionists Initially Unpopular?